The Valero Alamo Bowl game (named by its title sponsor Valero) is an annual college football bowl game in the post-season and takes place as one of the major pre-New Year's Day bowl games end of December at the Alamodome in San Antonio, Texas. However, starting in 2010 the game has been moved to after New Year's Day. It showcases two of the premier conferences in the country: The Big 12 and Big Ten. In 2010, its 17th edition since inception, the following teams will be matched-up: The Michigan State Spartans, representing Michigan State University (MSU) in East Lansing, MI in the Big 10 Conference vs. the Texas Tech Red Raiders, representing Texas Tech University, Lubbock, TX in the Big 12 Conference South. Although it is going to be Texas Tech's third appearance in the Bowl, they yet have to win it. Michigan State played in one previous Bowl game in 2003, losing to Nebraska 17–3. The game will also mark the first-ever meeting between the two schools. The title sponsor is Valero Energy Corporation (NYSE: VLO), a Fortune 500 oil and gas refining and retail company based in San Antonio, Texas, United States. 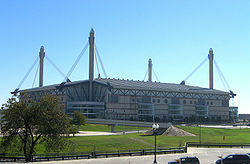 The event venue is the well-known Alamodome, which is (as many other stadiums these days) a multi-purpose stadium. It is located near the famous Riverwalk in downtown San Antonio. The Alamodome can hold approximately 65,000 spectators for football events (expandable to over 72,000). It is a rather new building. Just opened in 1993 the Alamodome is also the home of the University of Texas at San Antonio football team and the annual U.S. Army All-American Bowl. One of the next major events will be NCAA Womens Final Four. In addition, the building offers two permanent Olympic-size ice rinks that can be used for NHL games, figure skating and speed skating. Buy your Alamo Bowl Tickets now before it is too late and be one of the tens of thousands enthusiastic fans in this great stadium. Grab some great deals on dining, drink, and fun everyday in San Antonio!